A wildly popular spice mix, curry powder is a great way to add special flavor to your dishes and enjoy the wonderful health benefits that each spice in the mix offers you. Benefits range from burning fat deposits for weight management and offering antioxidant protection to boosting immunity, reducing inflammation and improving digestion and cognition. Each constituent of the mix holds the potential to improve one or more aspects of both physical and mental health. And the choice of spices in curry mixes makes a huge differences in the resulting health benefits. Curry powder mixes incredibly healthy ingredients such as turmeric, coriander, cumin, mustard seeds, ginger, pepper, garlic and other local spices, depending on the country where it is produced and used. Not only does the mix boast amazingly healthy ingredients, full of vitamins, minerals and antioxidants, but it also comes in both pungent and mild forms, the latter being more suitable for more sensitive palates and stomachs that do not enjoy or draw any benefit from the spiciness of certain ingredients. 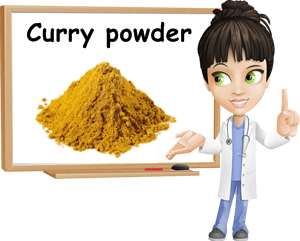 What is curry and what are the ingredients in curry powder? Curry is a famous spice mix used to add flavor (and hotness) to various dishes in South Asian cuisine. Over time, the mix has been adopted by other cuisines and is now available in most parts of the world as curry powder. This mix has several basic ingredients namely turmeric, cumin, coriander, to which several other ingredients are added depending on the culinary specificity of each country. Thus curry powder may contain a variety of other herbs and spices such as garlic, allspice, white or black pepper, ground mustard seeds, ginger, cloves, bay leaves, cumin, cinnamon or even red hot chili peppers. Considering the wide variety of herbs and spices, curry powder ranks as one truly healthy spice mix which shouldn’t be missing from our diet. Turmeric, for example, contains curcumin, a potent antioxidant, anti-inflammatory and antiarthritic agent and is an incredible source of vitamin B6, iron and manganese. Black pepper is rich in copper and manganese, two powerful antioxidant-minerals, while ginger has proven efficient against the Helicobacter pylori bacterium. 1) An ally against joint pain. Turmeric, the main ingredient in curry powder, has been shown to reduce swelling and relieve pain associated with joint inflammation. Regular consumption is said help improve arthritis pain, but also muscle pain and help reduce overall inflammation levels in the body. Experts recommend adding the spice to food at the end of the cooking process, to limit its exposure to cooking heat which may cause it to lose its properties. 2) Promotes cognitive health. According to researchers, turmeric, the major ingredient in curry powder, can significantly reduce the risks of developing Alzheimer’s Disease and other neurodegenerative diseases. This is due to curcumin, a compound in turmeric which prevents proteins called beta-amyloid from binding into plaques or pieces which may accumulate between nerve cells and prevent them from communicating with each other. This is believed to be the major cause for memory loss in Alzheimer’s patients. 3) Anticancer properties. The spices which make up curry powder, notably turmeric, show exceptional antioxidant activity and studies suggests that regular consumption of curry may reduce the risk of developing prostate, breast and skin cancer. Ongoing research also indicates that turmeric may stop the progression (proliferation) of tumor cells. Nevertheless, keep in mind that eating curry alone will not decrease cancer risks. Good overall lifestyle and dietary habits that involve no smoking, no drinking, no highly processed foods, no pollution as well as limiting stress are crucial elements for a long, healthy life. There is no miracle pill or food for cancer or any other disease; you just have to take care of yourself and live right. 4) Boosts immunity. Curry powder is rich in nutrients such as vitamins A, C and B6 which work together to protect the body from viruses and bacteria by maintaining a healthy immune system. For example, vitamin A ensures that the mucous membranes in our eyes, nose, mouth, throat, lungs and stomach, which are directly exposed to the outside world by means of the air we breathe and water or food we ingest, are healthy and can efficiently fight off the threats they are exposed to. Vitamin B6 (pyridoxine) maintains healthy immune system organs (or lymphoid organs) such as the tonsils, spleen or lymph nodes and makes sure they produce sufficient white blood cells to ensure a good immune response when needed. See more vitamins and minerals and information on their benefits and side effects in the menu page above. 5) Great digestion aid. Spices traditionally used to make curry powder such as anise, allspice, cardamon and black pepper are known to help relieve digestive discomfort and treat constipation, loss of appetite and abdominal cramps. Ginger is also a great antiemetic, very useful for treating nausea and preventing vomiting. Black pepper increases intestinal motility and promotes the secretion of gastric enzymes which aid digestion. Cloves alleviate flatulence, cover bad breath and are quite efficient in preventing the infestation with intestinal worms. 6) Burns fat. Thanks to its black pepper content, curry powder enhances metabolism by issuing the breakdown of fat cells in fat deposits, potentially contributing to weight loss. 7) Improves skin appearance and delays aging signs. Curry is a mix of antioxidant-rich spices which stimulate collagen production (vitamin C) and thus prevent premature aging signs such as wrinkles. Moreover, it contains natural compounds (curcumin) which protect the skin against the visibly damaging effects of exposure to air pollutants. Other compounds (potassium) regulate body fluids and thus counteract visible symptoms of water retention such as puffy face or swollen legs. Conclusion. If you are not a big fan of spicy mixes, you can always choose milder varieties, with less of some ingredients and more of others. Keep in mind that ingredients can vary immensely, depending on the brand. You can always mix your own curry powder and enjoy a healthy, homemade mix to your liking. However, as with all things, moderation is crucial so we can enjoy all the health benefits of the spices, without the side effects.